For the Democrat Party, immigration, legal or illegal, is a do-or-die issue as it represents a huge segment of the Democrat voter base. I know, I know, illegal immigrants can’t vote. If you believe that, I have a unicorn ranch on Mars you may be interested in buying. President Trump appears to be signaling a deal with Democrats. DACA, in some form, for their blessing on wall funding. Personally, I suspect that President Trump is softening on DACA, which is OK, in my opinion, and is using the wall (hint: which needs nary a Democrat to approve funding) to justify his softening on DACA. I could be wrong, but I see no need to use DACA as a bargaining chip to build the wall when no Democrat cooperation has been needed to build it so far or in the future as long as the GOP enjoys majorities in both chambers of Congress. The more likely explanation is, “Oh, yeah, I had to soften on DACA to get the wall built.” Chalk it up to public relations! As to the wall, it is going to be built! Prototypes are being built now to choose from for permanent construction. 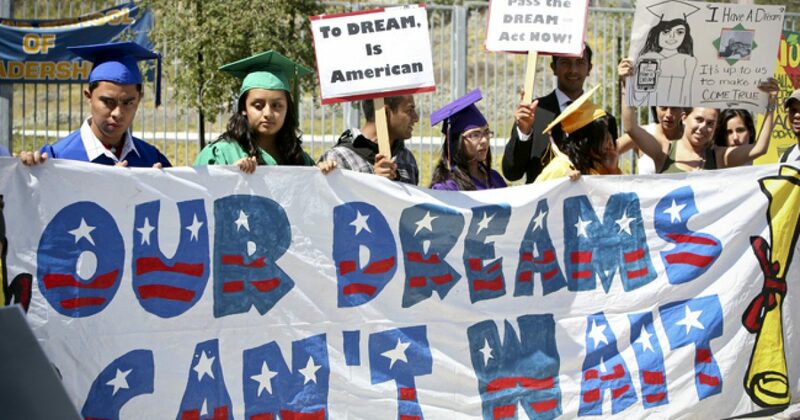 As to DACA, why can’t we design a path to citizenship for these people, many of whom were brought to the US at a very young age through no fault of their own. Except for the legal paperwork, they are Americans. They attended American schools, they know no other country, and many only speak English. Why can’t they be given a five-year probationary period during which they study to become citizens, stay out of trouble, take a citizenship test, and are then granted citizenship? I believe that is reasonable. If they don’t want to do that, then they can leave or be deported. I feel certain that all of them will want to follow this path to real citizenship. In the meantime, the wall must be built to keep out future violators. President Donald Trump is a master at the art of the deal — and lawmakers seeking a bipartisan immigration deal just got a clear message on Trump’s bargaining position. Trump promised voters he would not compromise on the southern border wall. Whether Democrats like it or not, the wall will be built… or there won’t be no deal on DACA. Bargainers planned immigration reform talks Wednesday as Trump and leading lawmakers seek to parlay an extraordinary White House meeting into momentum for resolving a politically blistering issue. Facing a Jan. 19 deadline for averting an election-year government shutdown, negotiators are looking at a formula for reviving protections against deportation that Trump has ended for nearly 800,000 illegal immigrants. In exchange, Trump and Republicans want toughened border protections and tightened restrictions on others trying to illegally enter this country. Trump said an immigration deal could be reached in two phases — first by addressing young immigrants and border security with what he called a “bill of love,” then by making comprehensive changes that have long eluded Congress. That second bill would likely face long odds for passage, considering long-running disagreements over issues like how to handle all 11 million immigrants illegally in the U.S. Negotiations over the DACA program may be more complicated in light of a federal judge’s ruling Tuesday night to block temporarily the administration’s decision to end the program. In doing so, U.S. District Judge William Alsup in San Francisco granted a request by California and other plaintiffs to let lawsuits over the administration’s decision play out in court. After Trump and lawmakers spent time meeting privately, the White House and numerous lawmakers said there was agreement to limit the immediate bill to four areas. These were border security, family-based “chain migration,” a visa lottery that draws people from diverse countries and how to revive the Deferred Action for Childhood Arrivals program. That Obama-era program has given hundreds of thousands — the so-called Dreamers — a shield from deportation and the right to work legally. Trump ended it last year but gave Congress until March 5 to find a fix, and Tuesday he signaled flexibility. “I think my positions are going to be what the people in this room come up with,” Trump said during the Cabinet Room meeting.